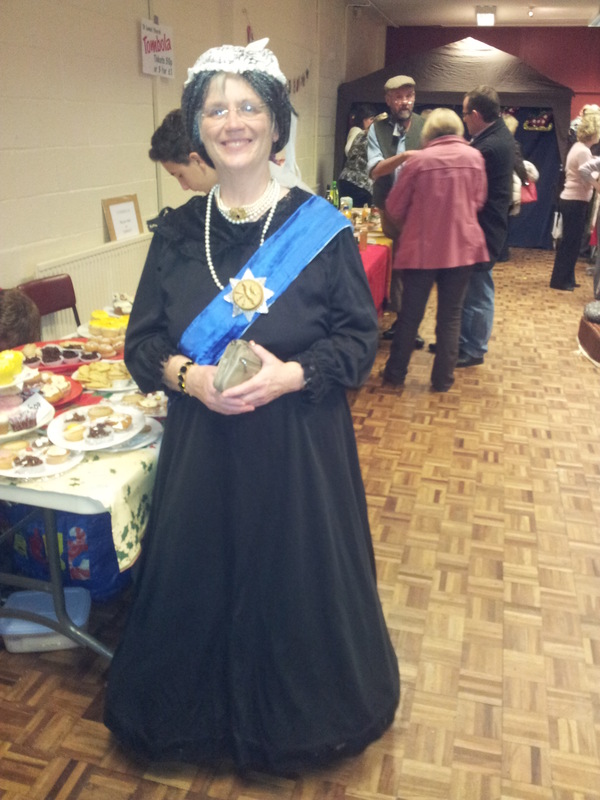 The Queen Vic arrives at Little Paxton! Whilst people were grumbling at the lack of the Vicar’s presence, it was good that HRH was able to find the village hall and grace her subjects with her Queenly ways and charm. She took time out to shake hands with many visitors, servants and gentry alike and enjoy the company of hearty village folk. 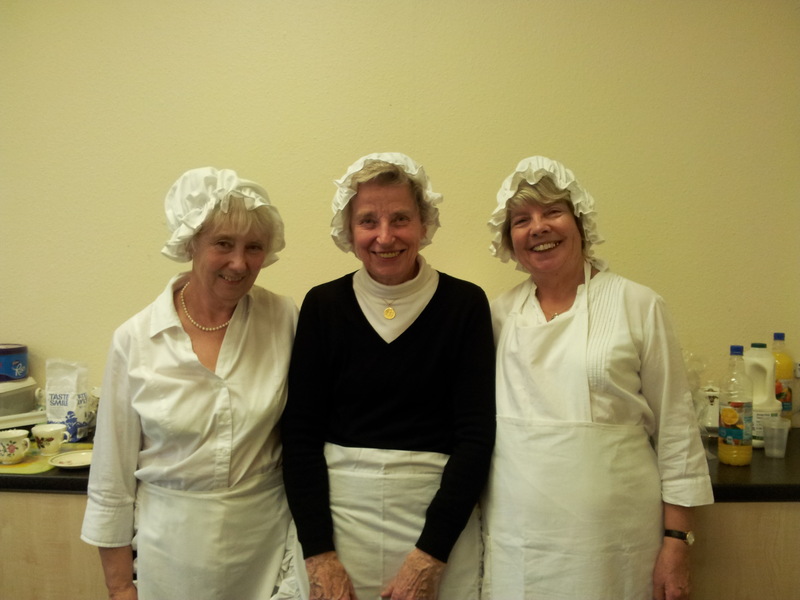 The team of servants were in great form with teas and cakes galore. 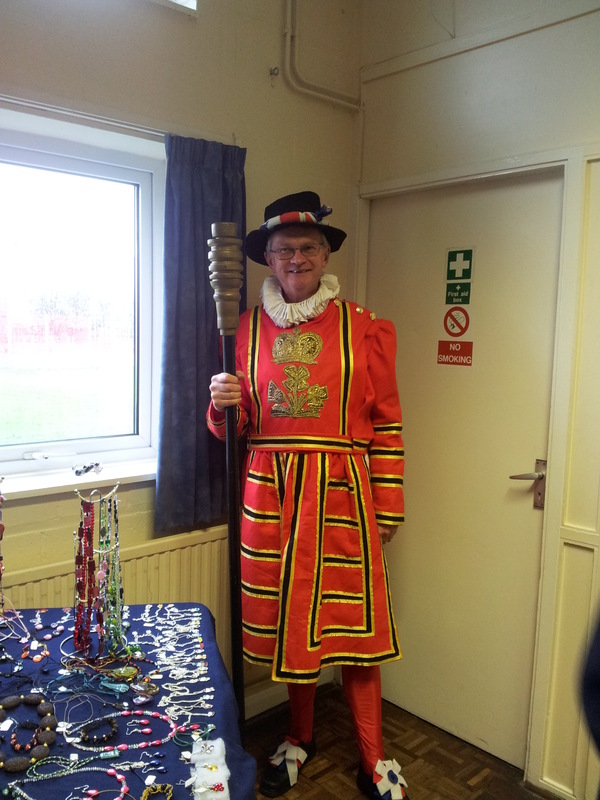 The Queen was attended throughout by a Gentleman Beef Eater who had come all the way from The Tower to keep HRH safe. A most wholesome occasion and it is to be hoped that all who came to sell their wares had a profitable day and those who purchased fripparies did so with joy in their hearts. Christ The King Sunday and the General Synod vote – one Vicar’s thoughts. Christ The King and Women Bishops. This is a very personal take on the Synod vote and the theme for tomorrow’s service. I’m still working out my reaction to the events at General Synod on November 20th 2102. 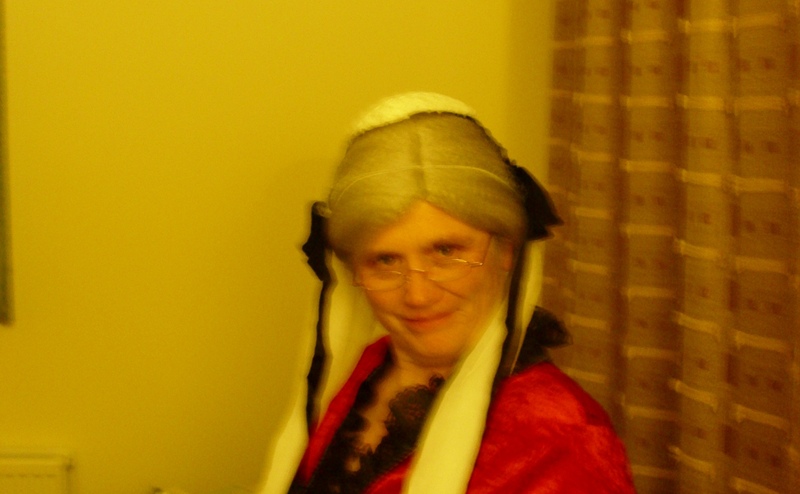 Having given her a couple of days to recover, I rang up one of our our Ely Diocesan Synod General Synod reps to see how she was. I remember well the campaign of the 1980’s for women to be allowed to test their vocation as deacons and priests; I was present in London when the 1992 vote for women priests was narrowly passed in the house of laity. This time round I felt duty bound to listen to most of the debate last Tuesday via the internet. I grew more and more despondent as a relentless number of conservative evangelicals and Anglo-Catholics stood up to speak against the legislation to approve the consecration of women as bishops. It’s important to remember those last words. 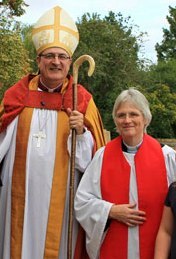 GS had approved some time ago the principle of women bishops, it was the draft legislation which was being discussed, legislation which aimed to give those who couldn’t accept women priests and bishops in all conscience a safe place still in the C of E free from the ministry of a female bishop. The cynical amongst us might say that those who spoke against the legislation are also implacably against women bishops anyway, and from the churning out of the old arguments it certainly sounded to me that many who were against the legislation just hoped to block it and put off what many view as the inevitable development of womens’ ministry. If taken literally then surely they should campaign for our Queen to be demoted as Supreme Governor of the C of E and all women who are serving incumbents and head up their church communities should resign as their orders are fatally flawed. Women in all walks of life should not be in positions of authority and not least in the marriage relationship should be in a subordinate role to their husbands. To love, cherish and obey indeed. Personally, I think women should be able to hold all forms of leadership within the Church. It’s a view I came to a number of years ago through reflection, debate and biblical study. The Anglo-Catholic wing of the C of E as it were got into bed with the conservative evangelicals and oppose women bishops on the grounds that a women cannot be a priest as it must be a male person who represents Christ at the sacrament of the Eucharist. Some also feel that the C of E cannot make such a serious development without the RC and Orthodox churches moving at the same time in their practice and theology. Again, not all Anglo Catholic Christians are against women bishops not least the Affirming Catholicism group who have campaigned hard for women bishops over the years. Still with me? Yes, it is complicated, complex and a mess. 42 of the 44 C of E Dioceses voted clearly for the legislation and hoped their GS members would represent them in the London vote. On the day, the measure fell by just 6 votes in the House of Laity – it failed by 6 votes to reach the needed 2/3rds majority. Overall 72.6 % of members voted in favour. The picture on the front of the Church Times said it all with a disconsolate Rowan Williams hugging a fellow dismayed synod member. “I am deeply sorrowful about the failure of the General Synod to pass the draft legislation to consecrate women as bishops. The hopes of a very clear majority of churchgoers around the Church of England have been thwarted for the time being. It is terribly wounding not only for our devoted clergy who are women, but also for me and all who long for women to exercise the ministry to which God calls them in all three sacred orders. Millions of words have been written and spoken since Tuesday in newspapers, online and on the radio. I’ve spoken to people about it in the car park of Bedford Crem, Tescos, out walking the dogs, in the dental surgery and at a fancy dress outfitters in Huntingdon. Bishop David and Bishop Stephen are having a meeting with women clergy next Saturday morning to support and affirm us in what we are doing. I shall be affirmed from a distance as it’s the Advent Workshop at school at that time. What got under my skin listening to the debate was the theology based on a literal interpretation of some of Paul’s words and a reading of the creation story (clearly one of the two versions) that women need to be in authority under men; the headship argument leaves me cold. Worse than that, I believe that over the years the teaching that women should be in submission to men has led to all kind of exploitation and even cruelty inflicted onto women. I couldn’t believe we were still hearing these beliefs after 18 years of women testing their vocation to the priesthood and in so many cases being found to be worthy and true to their calling. At the end of the day, or rather by 615pm that Tuesday afternoon, it was all about power. Would the hard done by alliance of those opposed to the consecration of women and who felt they were being pushed out by a liberal majority get their way and stop this legislation going through? The way that GS is structured at the moment, they were just able to do that. Everyone in the chamber and I expect across the country prayed in silence before the vote was taken. We know the outcome. It will come of course. How long it will take no one knows right now. One of the most unfortunate things about it is that there will have to be many more hours spent by church men and women on revising the legislation which could be used constructively on other things. All the while parish people and people outside of church circles look on and find the church at best an embarrassment or at worst totally irrelevant. Many I can assure you just don’t understand what happened and haven’ t got a clue about the headship argument, submission in the theology of the trinity or the sacramentally flawed presence of a women priest. And why should they? Because my check on reality tells me what most people are concerned about their families, their loved ones illness, their stories of loss, their worries over money issues, their children’s well being, their own health and well being and hopefully the big issues facing the world such as poverty, global warming and senseless killing. How sad that the established church nationally is fighting over women bishops when there are real and pressing issues that need to be addressed. What do our years on earth mean? What’s the point of it all? What happens after death and why do people suffer? Where is God in all of this? After the shock of the result I took stock. Then I got on with doing what I do every day. I made contact with people who are struggling with life. I organised a baptism and a wedding. I took an assembly. I wrote things for 3 in 1 and took a funeral. I walked the dogs and went to see my daughter. I did all those things because vote or no vote, that’s what we are called to do. Alongside each other we are called to minister to one another as Christ ministered to his friends and those around him. Christ The King Sunday comes at just the right time for me. The last Sunday before Advent, traditionally called Stir up Sunday. Stir up the wills, O Lord, of your faithful people. It says wills not emotions. Yes, it’s been very important for all of us who were dismayed by the vote to get the anger out and feel cross that something that should have been a case for rejoicing, the full acceptance of women in the church, has been thwarted so cynically. But our wills, informed by love, can tell us to forgive those who perhaps should have behaved in a better and fairer way. It was grossly unfair that Christ died on the cross in the way he did. His treatment was totally undeserved and his kingship, his triumph came not after a power struggle with the Roman authorities, but after a power struggle with all that was deeply flawed in the world. His disciples must have felt their lives had come to a full stop after he died. How could any good come out of what had happened? It was all so needless. But their despair was turned into joy three days later and what had seemed a disaster proved exactly the opposite. I have a feeling that by following Christ our forgiving, servant King, we shall look back in a few years time and see that the resolution of this impasse and see that even good came out of the No vote. All we must do is continually say Yes to God and let Him take care of the outcome and of our lives. And, the church is being talked about! What an opportunity to set people right about what we are really about and encourage them to join us. Maybe November 20th will turn out to be a blessing in disguise. Although indisposed last year, Its good to hear that HRH Queen Victoria will be arriving at Little Paxton Village Fayre sometime around 11.00am on Saturday November 24th. She is a little leaner than in previous years and does look rather elegant with her various regal accessories and will be encouraging her subjects to buy from a wealth of fripparies, trinkets and amusement stalls. Be prepared to be amused! Little Paxton Village Fayre – Saturday November 24th 11.00am – 2pm. 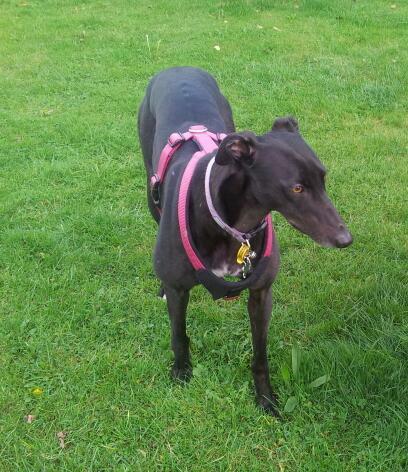 Having neglected Paxtonvic Blog for far too long, here I am! I’m amazed at the number of hits its been having every day despite the neglect and I’m glad people find it helpful. Life has been busy with a pleasant mixture of family and church stories not least the re-opening of St James Church in Little Paxton after a major re-ordering. Its given the building a new lease of life materially and spiritually and socially and Im loving being in there during the week when people drop in. 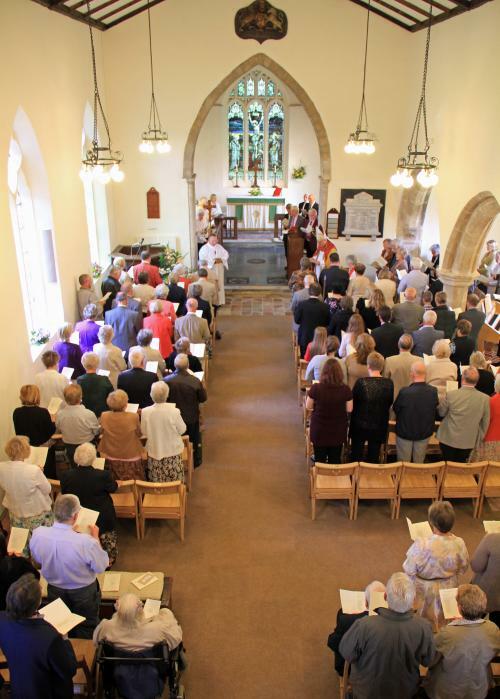 Here is a picture of the church at our rededication service in September taken from the new ringer’s floor. 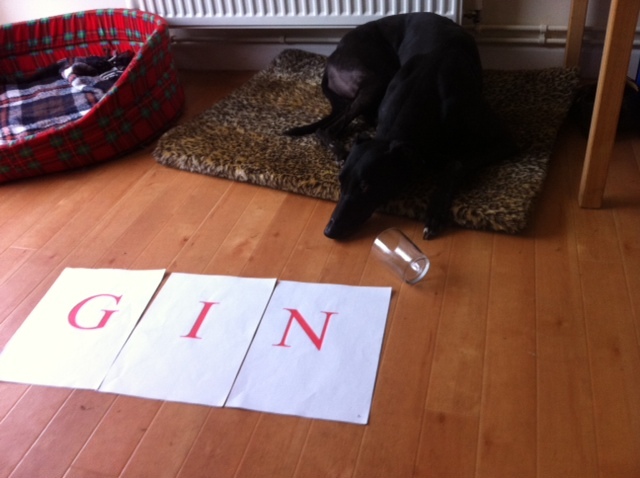 Not really gin of course… else I’ll have the Greyhound Rescue groups after me!